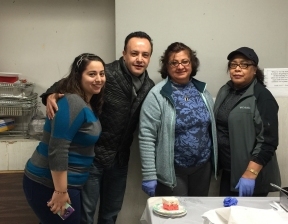 12th-Alderman George Cardenas supported Blessed Sacrament Parish by attending the annual Fish Fry on February 12th, 2016. The annual Lenten event is one of the Alderman’s favorites as he gets to personally meet and discuss ward events and incidences with diverse residents. The event was attended by more than 80 people this year making it a great success. BSP volunteers and Alderman Cardenas.